Charles David Todd is a famous television journalist currently working for NBC, MSNBC. Known for his appearance on Meet the Press, Charles David Todd is working for the show since August 14, 2014, He also hosts MTP Daily on MSNBC and is also the Political Director for NBC News. The resident of Washington D.C., Charles David Todd, reportedly earns around $750k, as his yearly salary from the network, and as of 2018, he reportedly has an estimated net worth of over $ 2 million. He is currently married to his longtime girlfriend Kristian Denny Todd and has a daughter Margaret Todd and a son Harrison Todd with her. Charles David Todd was born on April 8, 1972, in Miami, Florida, the U.S. to Stephen Randolph Todd and Lois Cheri. He holds an American nationality and belongs to White ethnic group. He is Jewish by religion. Charles David Todd after graduating from Miami Killian Senior High School in Kendall joined the George Washington University and studied Major in Political Science and Minor in Music but he did not graduate. Todd started his career as a political campaigner during 1992 presidential campaign of Senator Tom Harkin and later worked part-time at National Journal’s The Hotline. He worked at The Hotline from 1992 until March 12, 2007, as an editor-in-chief. He also co-hosted the webcast series Hotline Tv during that period. Chuck Todd started working at NBC from March 2007 as NBC News’ political director. He in his authority provided political analysis on different political shows such as Morning Joe, Hardball with Chris Matthews, NBC Nightly News with Lester Holt, Meet the Press and the Rachel Maddow Show. On December 18, 2008, Todd was declared as NBC News Chief White House Correspondent along with Savannah Guthrie. He became Contributing Editor to Meet the Press and also remained NBC News Political Director. Chuck also got into a contract with MSNBC and co-hosted The Daily Rundown with Savannah Guthrie. 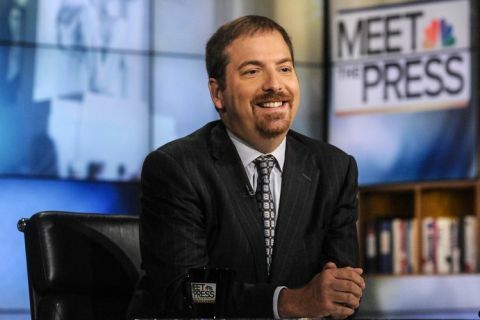 On August 14, 2014, Chuck became the host of Meet the Press on NBC network and he quit the position of White House correspondent and also the position of the anchor of The Daily Rundown of MSNBC network. Chuck again joined to MSNBC network and host a political show named MTP Daily on July 23, 2015. Chuck got into a controversy when due to a leaked email he and his wife were accused of working for Clinton’s challengers. But Todd denied those charges and state that that news are not facts but falsehoods. Besides television journalism, Todd also works at Johns Hopkins University as an adjunct professor. He has also has written and published book named The Stranger: Barack Obama in the White House and also co-authored a book named How Barack Obama Won: A State-by-State Guide to the Historic 2008 Presidential Election. Charles David Todd is one of the most popular television journalists working for NBC, and MSNBC network. As NBC and MSNBC are both very popular Network, it is well known for paying a heavy amount of salary to its anchors. As Charles David Todd is a regular NBC, MSNBC anchor, he earns a decent amount of salary from the two networks. The American television journalist Charles David Todd has an estimated net worth of $ 2 million. As of 2018, the reporter receives an annual salary of $750k from his successful reporting career with NBC, and MSNBC. He currently, lives in Arlington, Virginia, along with his family, and has a beautiful home there. The house purchased by him in the year 2007 for $1.74 million has an estimated current value of $1.55 million as of date. Chuck Todd is married to Kristian Denny Todd and they have two children a daughter named Margaret Todd and a son named Harrison Todd. The date of their marriage is not yet made known to the media and public. His wife Kristian Denny Todd is a communication guru and she is the co-founder of Maverick Strategies and Mail which is a system which provides service to Democratic candidates with direct mail and consulting services. She also serves as the spokesperson for Senator Jim Webb during the 2006 U.S. Senate Campaign who won the seat.